We think the Greater Lafayette, IN area is the greatest place on earth. Okay, there might be a couple of places competing in our hearts for the title of “greatest on earth”, but regardless, Lafayette, IN is fantastic. It’s full of things to do for any age or family size. There is a place where everyone can fit! Maybe you know everything there is to know about this town, but on the off chance you don’t, we’ll fill you in! 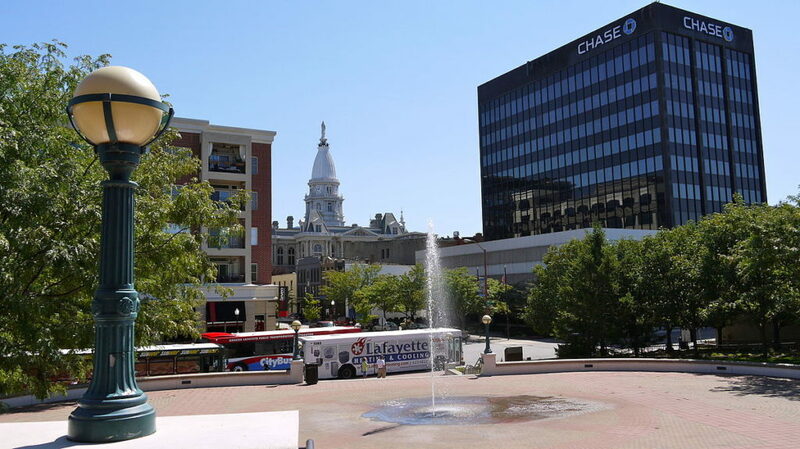 Here are some random facts and key points about Lafayette, IN! Lafayette, IN holds the No. 2 spot in “Best Small Places for Business and Careers” according to Forbes Magazine! Lafayette, IN has a few spots and drives with some spectacular views of the city. For a calming adventure, take a drive to view all of these spots! Top of Slater Hill proves to be one of our favorites. It gives a great view of Purdue University’s Campus. Coming up State Street when you look in your rear view mirror gives a fleeting glimpse of Downtown. It fun to catch the view in your mirror! Driving from the top of the Happy Hollow Hill in the winter. Through the trees, you view the Wabash River with both Lafayette and West Lafayette complementing each other. Drive along 430 S between 18th st. and Concord in the winter. Through the trees, you see Lafayette in all her glory! There is a mountain bike trail behind the Haan Mansion Museum. It’s an intermediate level trail with some advanced loops (Haan Mansion Museum Website). It’s super fun if you’re into mountain biking and developing your skill set! Every Tuesday is $5 movie night at all local Lafayette, IN Goodrich Quality Theater movie theaters! Click here to view locations! Lafayette, IN has a SERIOUS number of museums and historical resources. Click here to view the most popular ones in our area. Wildcat Park has a beach for those hot and humid summer days! The Wildcat also offers perfect conditions for tubing, kayaking, or canoeing. Click here to view the Wildcat Canoe and Kayak Rental website and plan your next summer adventure! The Igloo Frozen Custard is a family restaurant open since 1932. According to their website, in the beginning days, the owners used salt to freeze their custard because refrigeration was not an option! Now, both igloo sites have refrigeration for their delicious custard treats! Lafayette, IN has a minor league baseball team! The Lafayette Aviators represent our community in style! Check them out this summer at their next in-season game. The Bicentennial Nature Area to the North of Lafayette, IN houses a huge pond perfect for fishing or kayaking. Lafayette, IN has many Nature preservation areas throughout the city. Here are just a few of our favorite spots!